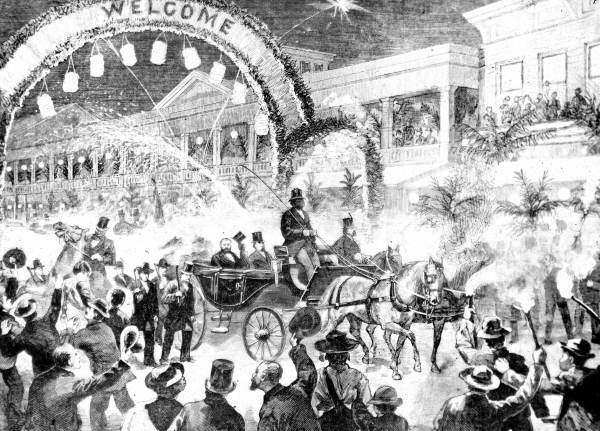 The 1863 Fourth of July celebrations in Key West, Florida likely resembled those captured in this image from January 1880 in which former U.S. President Ulysses S. Grant and General Philip Sheridan arrived at the Russell House on Duval Street (Florida Memory Project, public domain). It was the Fourth of July, 1863, and the native sons of Pennsylvania enrolled for Civil War military service with the 47th Pennsylvania Volunteers were stationed about as far from home as they could possibly be. The men serving with Companies A, B, C, D, and I were stationed at Fort Taylor in Key West, Florida while those assigned to companies E, F, G, H, and K were toughing it out at Fort Jefferson, the Union’ remote outpost in the Dry Tortugas. The men from D Company had only just returned to Key West from Fort Jefferson a month earlier. 1. Letters from Henry D. Wharton, in Sunbury American. Sunbury, Pennsylvania: 1861-1865. 2. Schmidt, Lewis. A Civil War History of the 47th Regiment of Pennsylvania Veteran Volunteers. Allentown, Pennsylvania: Self-published, 1986.